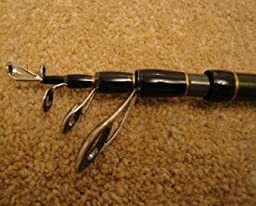 A portable rod used to mean two or three longish sections that plugged together. 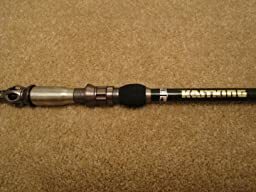 Telescoping carbon fibre rods such as this Kast King Ranger have revolutionized the situation since then. I’ve tried both the 8’10” and 7’10” versions of the Ranger, and they’re both superb. It amazes me how light and compact it’s now possible to make a full size, full strength rod! 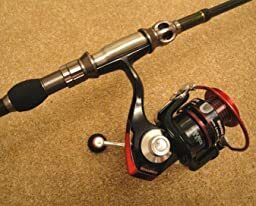 Coupled with a lightweight reel such as the Sharky II Spinning Reel that I’ve also reviewed, it makes a fully portable fishing kit that you can easily carry in your rucksack, suitcase or car. These rods would be absolutely ideal for kayaking or dingy sailing trips too, where space is at a premium. The sections all slide smoothly and lock securely with a taper fit when extended. All the eyes have ceramic inserts too, minimising friction and reducing the chances of line failure. I do like the protective plastic boot that the rod is supplied with – it covers the tip during storage or transport, and keeps those ceramic lined eyes safe from damage. When extending the rod the sections lock together simply by virtue of the the taper fit between the tube sections, and I find this works remarkably well. The handle is slim compared to most rods, but that’s part of the weight reduction strategy, and I find it perfectly comfortable. There’s a padded neoprene sleeve at the base, and – unlike some competitors – it has a small rubber section further up the handle too. This is a good feature as I find it helps the hands sit at the correct position, and it provides a pivot point when casting. 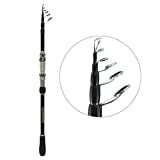 This rod is a pleasure to use, and has a good flex but retains a nice firm action. The danger of flexible rods is that they can have too much residual spring, which interferes with accurate casting. The Ranger is very nicely damped and won’t bounce around after the initial cast. It’s also very strong, so despite the diminutive size it will cope with some pretty impressive size catches. 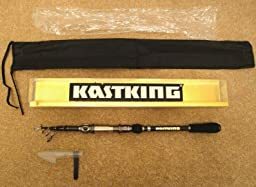 I give this rod top marks – quality is excellent, it’s very good value, and it gives you the chance to own a compact and highly transportable fishing kit that you can take on holiday or travel with whilst avoiding any worries about the size or weight of it getting in the way. A pleasure to own and use, great value for the money being asked, and therefore highly recommended!